We are renowned Manufacturer, Exporter and Supplier of honey with weight loss herbs. 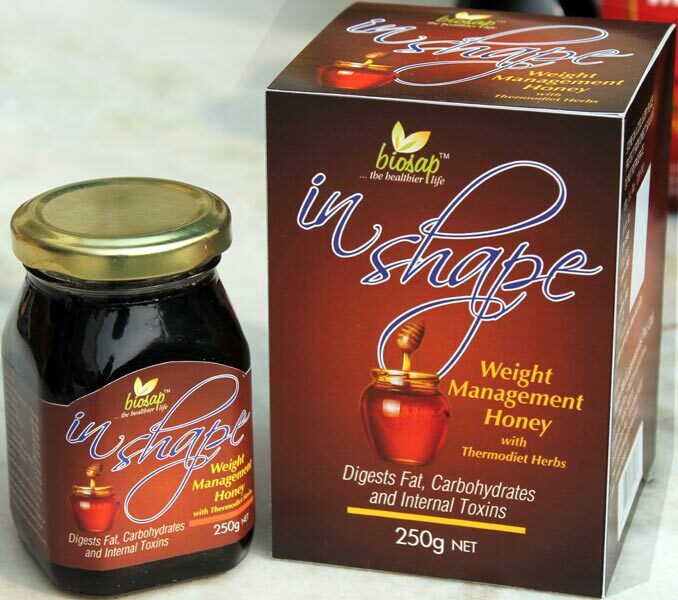 Honey In Shape Honey a weight management supplement is a delicious ayurvedic formula containing honey processed with exotic spices and rare herbs. Long Pepper, Cinnamon, Black Pepper, Dry Ginger, Curcuma zedoaria and cinnamon cassia. Traditionally honey is used as an antimicrobial to treat bacterial gastroenteritis and dyspepsia, factors responsible for large tummy and accumulation of fat around the abdomen.Honey and carminative and digestive spices of honey tuck tummy burn fat by igniting pachak pitta (digestive fire) and improve digestion. Honey along with spices is traditionally used for fighting overweight and allied problems. Ingredients : Honey, Extracts of cinnamom, catkins , Embellia ribes, Cyperous rotundus, Aloe vera, Natural spicy flavour. Suggested use : Take 1 to 2 spoon full into 100ml hot water stir and drink before breakfast and with evening snacks.